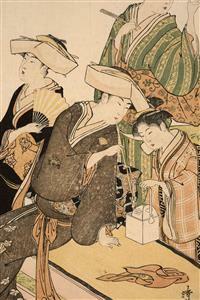 Signé Kiyonaga ga, cachet de collectionneur Hayashi Tadamasa. Vente Leroux, le 19 octobre 1896, n°25. 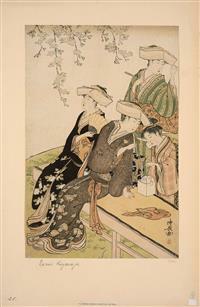 Right sheet of the diptych Fûzoku Azuma no nishiki, Current Manners in Eastern Brocade, An Outing in Spring, Group of Women Under a Blossoming Cherry Tree.